One of the world's best loved vegetables, potatoes are a common ingredient in many modern dishes, and they offer a number of health benefits. Potatoes are native to South America, namely Chile, Bolivia, and Peru. Before making their way to Europe, potatoes were cultivated and consumed for thousands of years in South America, seen by the Spanish Conquerors for the first time in 1535. However, it wasn't until two centuries later that they were finally embraced by Europeans. For many years after their introduction, European people were convinced that eating potatoes would cause terrible diseases, such as leprosy and syphilis, partly because the crop was not mentioned in the Bible, which meant it was unfit for human consumption. The change in perspective did not occur until the 18th century, when potatoes triggered a tangible population boom wherever adopted thanks to their alimentary value. Controlling blood pressure. When consumed in moderation, as a part of a healthy diet, potatoes have been shown to lower blood pressure, as well as improve lipid profiles and decrease inflammation markers. Treating skin problems. The antimicrobial properties of potatoes have been used for healing superficial wounds and skin rashes, as well as for improving skin appearance, thanks to their antioxidant properties. 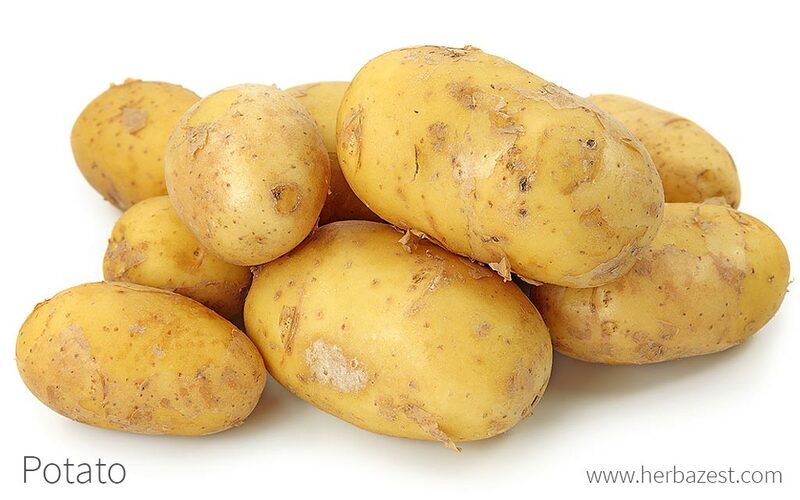 Additionally, potatoes contain dietary fiber -mostly concentrated in the peel- which improves digestive health. Furthermore, potatoes have been successfully used for treating Staph infections, as well as for preventing dehydration during stomach infections. Potatoes have many essential nutrients and minerals. They also contain dietary antioxidants, which may play a part in preventing age-related diseases, and dietary fiber, which benefits both digestive and cardiovascular health. The presence of potassium in potatoes plays a key role in controlling blood pressure, because it blunts the effects of sodium. It also contributes to relax blood vessel walls, which further helps to reduce hypertension. The active compounds in potatoes vary depending on the flesh color. Unlike other varieties, purple potatoes contain anthocyanins, which are antioxidant agents. They also have significantly more phenolic compounds than white and yellow potatoes. On the other hand, potatoes with yellow flesh contain more carotenoids - which are vitamin A precursors - than other varieties. The anthocyanins in certain varieties of potatoes, such as 'Vitelotte', also have antimicrobial properties, namely against Staph and Rhizoctonia solani. While many of the phytocompounds in potatoes have not yet been identified, their nutritional value is well understood. In the late 20th century, a decoction made of potatoes, carrots, sugar, and salt was authorized by the World Health Organization as a home alternative to oral rehydration therapy (ORT) for stomach infections, since it yields a potassium- and beta carotene-rich liquid that can help replenish lost nutrients. This recipe proved invaluable in many infectious outbreaks and famines across South America, Southeast Asia, and Africa, where logistic problems or geopolitical conflicts prevented the proper distribution of ORT bags. Antimicrobial benefits can be obtained from mustard and thyme, while passion fruit and saffron also have hypotensive properties. Potatoes are considered generally safe for most people; however, like most good things in life, moderation is the key. Potatoes are high in the type of carbohydrate that the body digests rapidly, causing blood sugar and insulin pikes that can result in people feeling hungry again soon after eating, which may then lead to overeating. Excessive consumption of potatoes can increase, in the long-term, the risk of cardiovascular disease and type-2 diabetes. Potatoes contain a toxic compound called solanine, which is more concentrated in the green tubers or new sprouts of the potato plant. People allergic to nightshade species can experience symptoms that usually include: joint pain, stiffness, headaches, dizziness, diarrhea, nausea, mild depression, and skin irritations. Nightshades can also make worst existing inflammations and joint pain in sensitive individuals. The potato is a carbohydrate-rich, energy-providing food, with little fat and one-fourth the calories of bread. A medium-sized potato contains about 115 calories. Potato protein content is fairly low but has an excellent biological value of 90-100, similar to that of cereals, and very high in comparison with other roots and tubers. A single medium-sized potato of 150 grams provides nearly half the daily adult requirement (90 mg) of vitamin C (ascorbic acid). An average serving of potatoes with the skin on provides about 10% of the recommended daily intake of fiber. When boiled, potatoes have more protein than maize and nearly twice the calcium. A raw potato contains about 80% water and 20% dry matter, 60-80% of which is starch. The potato is a moderate source of iron, and its high vitamin C content promotes iron absorption. The potato is also a good source of vitamins B1 (thiamin), B3 (niacin), and B6 (pyridoxine), as well as minerals such as potassium, phosphorus and magnesium. Additionally, it contains folate, pantothenic acid and riboflavin. The versatility and relative low cost of potatoes is what makes them such a popular ingredient in food, as well as the fact that they are quite filling. They can be baked, fried, mashed, boiled, grilled, and roasted, and they are featured heavily in many modern diets around the world. Although the main uses of potato are culinary, the medicinal properties of this Andean native tuber can be reaped from herbal remedies and supplements. Cooked. While there are many unhealthy ways to eat a potato (e.g., as fries, chips, or a buttery mash), this tuber can be prepared in an incredible variety of healthy ways, being boiling and baking the most beneficial. Dried. Dehydrated potatoes, whether as whole or in small pieces, maintain their high nutritive value with less nutrition loss. Dried potatoes, previously soaked in water, can be prepared in soups, stews, and many other dishes. Flakes. Previously cooked and dehydrated, this form of potatoes is commonly used for preparing mash, soups, and many other dishes. Juice. Raw potatoes can be juiced, alone or with other herbs, in order to take advantage of their nutritional and anti-inflammatory benefits. Powder. Dried and finely ground, this for of potato is often consumed as a supplement. Starch. Potato starch is a very common thickener for soups, sauces, and custards, and also provides a crusty exterior to fried foods. Oral solution. When boiled with salt and sugar, the liquid and starches of potatoes made a great life-saving oral rehydration therapy for severe stomach infections. Poultice. Skin problems, such as wounds, burns, and rashes can be treated topically, with a compress of raw grated potatoes in order to reduce inflammation and prevent infections. Although relatively rare, potato's protein extract can be found in capsules, and marketed as a supplement for weight control. Potatoes can be obtained from grocery stores year-round, with some varieties being seasonal and only available at certain points in the year. Raw potatoes are easy to find in most supermarkets and grocery stores around the world. They are generally bought in sacks and with the skin still intact, although it is possible to buy pre-peeled or pre-prepared potatoes in many places. Additionally, other natural products, such as potato flakes, powder, or starch are widely available in supermarkets and online retailers. Most herbal remedies of potato are home made preparations; however, potato capsules can be easily purchased online. Potatoes can be grown from the seeds in their green fruit or from the sprouting tubers themselves, but growing them from seed is rare. The seed potato (which simply means a tuber that is planted for the purpose of producing more potatoes) can grow in most soil types, but for optimum growth, it is best to aim for well-drained, loamy soil. Potatoes are very hardy and frost resistant, but are prone to infestation by weevil beetles and Phytophthora infestans fungi. In order to prepare for planting the potatoes in spring, the deep plot should be dug in late autumn or early winter. This way, the frost can break down the soil structure. Seed potatoes also need to be prepared beforehand - cut any tubers larger than a chicken egg into pieces, with no more than two eyes (buds from which the new crop will grow) on each piece. These should be kept in a warm place for two to four weeks, or until they start sprouting. Seed potatoes should not be planted until the soil temperature has reached 40°F (5°C), and the plot requires about six hours of sun every day. It is generally recommended to leave three to four years in between growing potatoes on the same plot in order to avoid disease. Some may not know: the visible part of the potato is actually poisonous to humans, and the only edible part is located under the ground. The potato is a perennial plant that grows up to 3 feet (91 cm) tall. It has branching stems with compound leaves and white or purple flowers. The swollen tubers (part of the root) are the most well-known part of the plant, but unbeknownst to most, it also produces green fruits that are very similar to a tomato. Potatoes (Solanum tuberosum), categorized under the Solanum genus, are members of the Solanaceae or nightshade family, as well as other economically important species: eggplant, peppers (including bell pepper, cayenne, and chili pepper), and tomatoes. Less known members of this family are goji berries and ashwagandha. There are innumerable varieties of potato that have been developed over the years, depending on their region. Roughly, they can be classified according to color, as russets, reds, whites, golden, and purple potatoes. However, it is estimated that over 5,000 varieties have been developed in South America by the Quechua and Aymara peoples. Because many of the traditional cultivation areas are remote and have been subjected to repeated warfare, many of these unique varieties are considered endangered, while others have not been properly classified. Seven recognized potato species and 5,000 potato varieties are grown in the Andes. The origins of potato can be traced back 8,000 years ago to the area surrounding Lake Titicaca, which sits at 12,500 feet (3,800 m) above sea level in the Andes mountain range of South America, on the border between Bolivia and Peru, where communities of hunters and gatherers began domesticating the wild potato plants that grew around the lake in abundance. The Spanish invasion, in 1532, spelt the end of the Incas - but not of the potato. Spanish explorers realized the nutritional value of potatoes, and introduced them into Spain as early as 1570. In 1613 they were shipped from England to Bermuda, and from there to Virginia in 1621. By the end of the 17th century, potatoes had become the food staple of the Irish, and the cultivation of the Andean tuber continued to spread throughout the world during the 19th century. In some parts of the high Andes, farmers still measure land in "topo", the area a family needs to grow their potato supply. The potato plays an important role in many cultural practices of the Quechua ethnic group in the Andes. One particular practice involves a prospective daughter-in-law being presented with a pinecone-shaped tuber, which she has to peel. If too much is peeled off, the marriage cannot go ahead. Having enjoyed a long history in South America, the potato is now one of the world's most popular vegetables. It is now cultivated worldwide, with 20 million hectares in total dedicated to this purpose producing more than 300 million metric tons per year. The potato industry is now worth a massive $116 billion USD per year. China is the leading producer, growing 86 million metric tons annually. On the other hand, the highest potato yield per hectare belong to the Netherlands, who harvest an average of 50 tons per cultivated hectare of potato crops. As potatoes are considered an easy-to-find and cheap material around the world, they are widely used for different industrial purposes. Alcohol ingredient. Potatoes are fermented and distilled in many parts of the world to make alcoholic beverages, such as vodka or akvavit. Thickening agent. Potato starch is commonly used a thickening or stabilizing agent in the food industry and for animal feed. Eco-friendly products. New research is emerging for the use of potatoes as the basis for biodegradable plastic products, like wrapping and plates. Fuel. Byproducts from potato are being developed into fuel-grade ethanol. Germplasm Resources Information, Taxon: Solanum tuberosum L.
Annals of Medicine, The role of potatoes and potato components in cardiometabolic health: a review. Choose My Plate, Why Is it Important to Eat Vegetables?